Indiana’s aquatic ecosystems account for close to 6 percent of the state. Rivers, streams, lakes, and ponds make up an estimated 575,000 acres, or 2.3 percent of the Hoosier state, while 3.5 percent, an estimated 815,000 acres, is covered by wetlands. 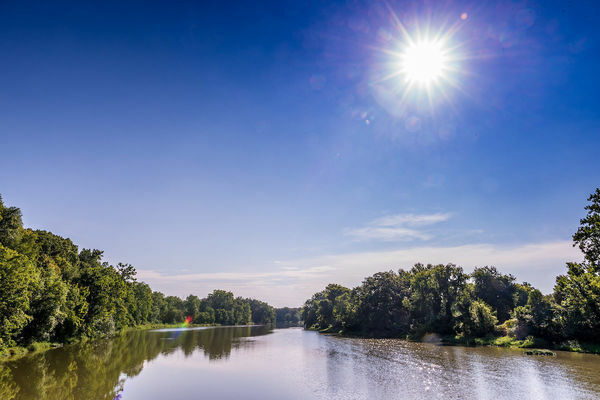 Industries such as agriculture, transportation, and recreation all benefit from the health and stability of Indiana’s freshwaters. Now a new report released by the Indiana Climate Change Impacts Assessment (IN CCIA) suggests that with warmer temperatures and increases in precipitation, effective management and conservation of the state’s freshwater ecosystems will be vital for the organisms that live within them to adapt to climate change. Tank is one of more than 100 researchers and experts who have contributed to the IN CCIA, a collaboration being led by the Purdue University Climate Change Research Center. The report addresses nine areas of impact to the state as a result of climate change, including agriculture, infrastructure, energy, water resources, forest and urban ecosystems, aquatic ecosystems, tourism and recreation, and health. Warmer air combined with heavier rains will cause plant species to shift in and around wetlands, altering breeding patterns of certain insects and amphibians. Stream flows will become increasingly variable, threatening survival of sensitive species within the state, including Indiana’s endangered freshwater mussels. Invasive species may find Indiana’s warmer waters a more suitable habitat, and more flooding could carry those species into new territory. How various species of plants and animals will respond to changes in climate is hard to predict–given concurrent changes in land use and management. Additionally, scientists studying climate change in Indiana expect warmer temperatures and increases in precipitation to make for a longer growing season. Precipitation is expected to rise 6 to 8 percent by the middle of the century, and 5 to 10 percent by late century. Heavier, more frequent rains will cause an increase in runoff from agricultural fields, carrying excess nitrogen and phosphorus into nearby bodies of water, causing algal blooms and threatening the habitat for coldwater fishes like the trout species. Scientists do not expect trends in the state’s climate to reverse course, warning that changes will only ramp up over the next century. For more information, visit www.indianaclimate.org. The IN CCIA has released six of its nine reports so far. Details for each released report are available online. In addition to Tank, contributors to the report include Tomas Höök at Purdue University and Illinois-Indiana Sea Grant, the lead researcher for the study; Paris Collingsworth and Carolyn Foley, also at Purdue University and Illinois-Indiana Sea Grant; Leslie Dorworth at Purdue University Northeast and Illinois-Indiana Sea Grant; Brant Fisher at the Indiana Department of Natural Resources; Jason Hoverman and Elizabeth LaRue at Purdue University; and Mark Pyron at Ball State University. Originally published by Jessica Sieff at environmentalchange.nd.edu on November 19, 2018.